The FV215b is a British tier 10 premium heavy tank. A proposed plan for a heavy tank based on the Conqueror Mk.II. Unlike the production model, this modification featured rear placement of the fighting compartment. Never saw production or service. Most easily likened to the American T110E5, the 215b is outfitted with a marginally better hull than the Caernarvon and Conqueror. Nevertheless, the tank makes some spectacular leaps from its predecessor in terms of turret thickness, gun performance, general stats, and not the least agility as it receives roughly a 65% increase in traverse speed. Also, its rear mounted turret enables gameplay slightly similar to that of the Maus and may take a bit of time to adjust to when coming off of the traditional layout of the Conqueror. The FV215b enjoys a low vertical profile and can effectively take cover behind most terrain irregularities. As a sniping tank, few other heavy tanks excel at unleashing as devastating a barrage of gunfire as the FV215b. Combine that with it's superb maneuverability, the fact that this tank can re-position effectively and cover an area with confidence, and the FV215b becomes a lovable machine which handles effortlessly and rewards daring players with great results. The FV215b was replaced with the more historical Super Conqueror and turned into Special vehicle in 9.20.1 patch. Gun is very accurate, aims very quickly and has amazing rate of fire/DPM, best in its class. Best hull traverse speed of all tier 10 HT´s,including the French one. Fuel tanks at the front, fire extinguisher is a must. Lower plate is only 70mm thick, increadibly easy to pen even by tier 8 Lights. 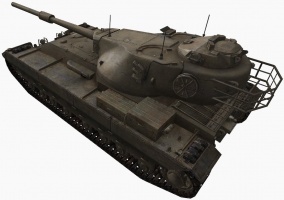 The FV215b shares a few similarities with the American tier 10 heavy, the T57 Heavy Tank. Both have above average gun depression, both have 400 alpha with amazing guns stats and both have very high penetration (258 and 259) however the FV is just that bit more accurate, bit more faster to reload and has that little bit better gun handling. More often than not, the trick to playing the 215b is to play it as a low tier German heavy tank. It cannot perform on the front lines due to the low alpha (for a heavy) gun, low LFP armor, and significant vulnerability to artillery. It performs much better as a sniper where its quick aim time, high accuracy, and DPM to cut down opponents without mercy. Should the opportunity present itself, the 215b can also hull down successfully due to the moderate (7 degrees) gun depression and tough turret. If you for example get a city map like Ruinberg and you can't hull down or snipe, your can still side scrape. Wait to receive a shot, then peek out and fire back at the enemy once or twice depending on how fast your reload is compared to theirs; although your reload is the fastest in your class. No tier 9 or 10 heavy tank will be able to beat your reload. For example for every time an E-100 shoots you can fire twice with enough time to get back into cover afterwards. The armor and hull traverse speed will protect you against flankers. The gun is an absolute beast, especially if equipped properly. If you have 100% crew with BIA, Vents, Gun Rammer and puddding and tea. You can get your reload down to 6.88 seconds which is absolutely insane. You can win straight up DPM wars (except against Russian tier 10 meds). The gun can also be used as an insane sniper, again with all the equipment mentioned above you can get your accuracy down to 0.3 and aim time to 1.5, plus the gun handling is all round really good. This gun on this tank is what sells this. If willing, you CAN use Pudding and Tea (premium consumable, buff to crew stats), but this is highly unrecommended as the FV215b is very fragile with the hull, so overall it should be a fire extinguisher instead. 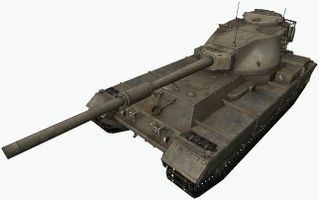 The FV215b in World of Tanks is a fictional combination of the FV215 chassis and the Conqueror's turret and armament. There were no plans to ever mount the turret and hull of the two tanks together. The FV215b as it is ingame is a complete Wargaming fabrication. 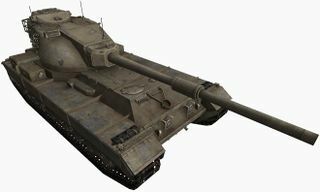 The rear mounted turret Conqueror, known only as the FV215, was only planned to be armed with a 183mm gun, which exists ingame as the FV215b (183). 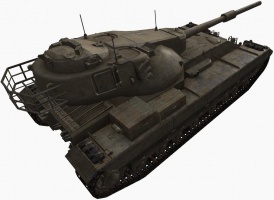 Wargaming took the original tank destroyer, replaced the 183mm with a 120mm, replaced the turret with the Conqueror's, and called it a heavy tank. David Flether, The Big Gun Centurions, Classic Military Vehicles, 10–2012, Key Publishing Ltd. This page was last modified on 17 May 2018, at 18:26. This page has been accessed 428,469 times.